Cool Graffiti ABC Coloring Pages 10! 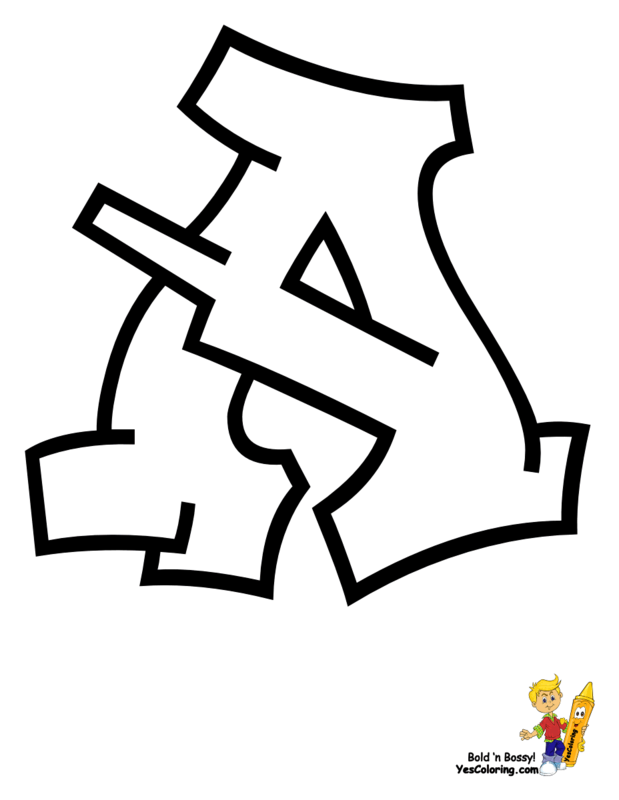 Smooth Graffiti ABC Coloring Pages For You Kids To Print Out. Use These Graffiti Printables For Your Scrapbooks, Signs, Bulletin Boards, and Rooms Decoration! Looking for some great preschool alphabet activities? One of the very first things we need to do when learning as children is to learn our alphabet so that we can read. Without understanding your letters, in whatever language you may have as your native tongue, you will not be able to excel in other subjects. Here are a some super cool ways to help your preschoolers learn the alphabet through fun and games. Scrapbooking - One of the growing areas in arts and crafts is that of scrapbooking. With your children, what you can do is put together a scrapbook that has one page per letter of the alphabet. Cut out letters and pictures from old magazines, newspapers or junk mail and have the kids paste them onto the appropriate pages. Preschool alphabet activities are really easy , if you look hard enough. Label House Hold Items - Write the name or draw a picture of things around the house and tape them to those objects. Another option: have the kids tell you what they are called, and show them how to spell it letter by letter. Repeat often as you pass by these labeled objects so the children can memorize them. Play and jump around - Preschoolers love to play, let's face it. They love games like "Simon Says" and "Follow the Leader". Well, let's be real fun about the alphabet and have them do some active learning. For example: "A" is airplane, have them pretend they are an airplane. "B" is for Ball, you can play with a ball. "C" is for clap, and you can clap. This type of game would go through all of your alphabet letters, using whatever activity you can think of that starts with the letter you are on. ...Treasure Hunts - Again, you can go through old magazines and newspapers cutting out different pictures and pasting them onto a piece of paper. Next, go for a walk in the neighborhood and cross off each item as you find them. Memory - Make duplicate flashcards for all the letters of the alphabet. Using about six sets at a time, place them upside down and have your preschoolers flip them over one at a time until the find the match. Flip wrong answers back around and keep the sets. Flashlight Letters - When camping or just a nice night at home, turn off all the lights and use a flashlight to form letters in the air and have the kids name them off. Letter Search - Performed like word search, you will go through a page in the newspaper, and have your child name off a letter and circle it. Then see how many they can find on the page. Hopscotch - Using cardboard letters, space them out on the floor or in the yard. Have your preschooler hop from one to another. Either tell the child the letter or have them tell you. Then, have them do an activity that starts with the letter. For example: "L" is for laugh, and they would laugh. Now, head on out there and have some fun! These Are Great Graffiti Handwriting Practice - Posters - Announcement Boards and Memory Books, Too! You Are Here: Cool Graffiti ABC Coloring Pages 10!